This film was directed by Rosie Sullivan, one of our talented story artists. I had the pleasure of working with her for about 6 weeks. It was my first experience with 2D, hand-drawn animation, and I absolutely loved it! The animators did all their own roughs, cleanup, and even coloring in TV Paint. The background paintings and compositing were handled by other artists. We had a very short and intense schedule and a shoestring budget, but honestly it was the most fun I've had animating in years. I hope I have the chance to do more 2D animation soon! My friend Tracy Burns is teaching a limited-series acting class tailored specifically for visual artists working in animation, gaming and VFX. The classes will be held on four Saturdays, 10:30am-1:30pm, March 23 – April 13. 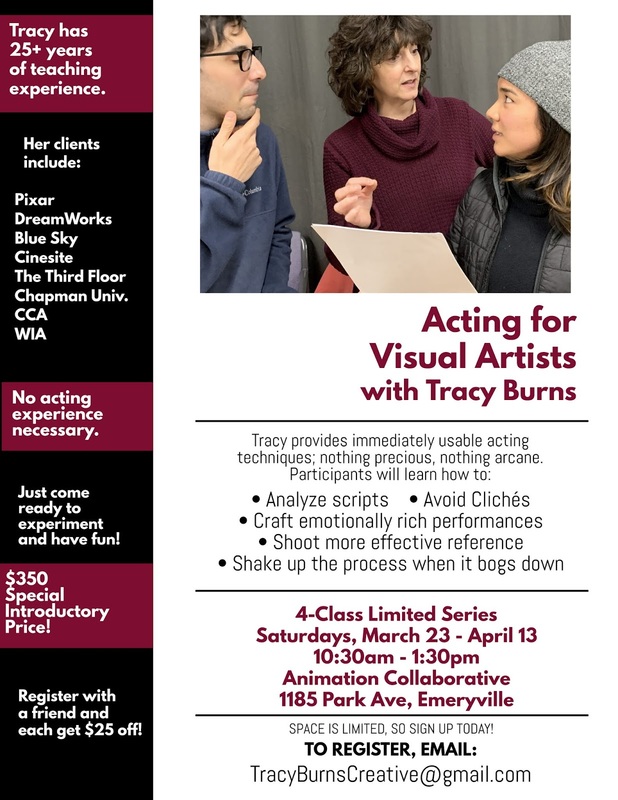 For those of you who don’t know Tracy, she is a performance consultant and acting teacher with more than 25 years of experience. She is the Acting for Animators teacher at California College of the Arts and teaches a variety of acting and visual storytelling classes at Pixar, DreamWorks, Blue Sky Animation, Cinesite, The Third Floor, The Animation Collaborative, Chapman University and other animation studios and production houses. I have had the pleasure of studying with her and teaching with her! Below is more information on the class and how to sign up. $350 - Special introductory price! 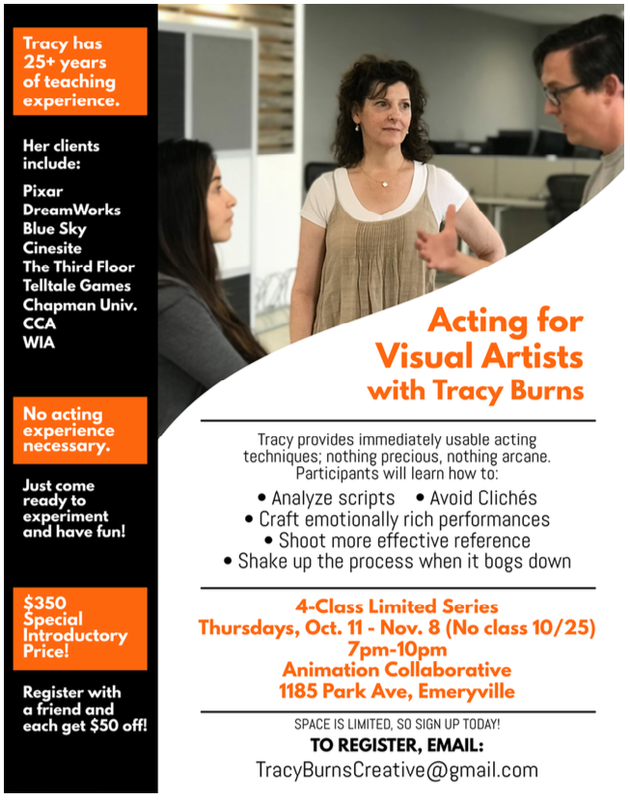 In this class, Tracy provides directly applicable acting techniques that are immediately usable whether you’re in Story, Layout, Animation or any other department; nothing precious, nothing arcane. No prior acting experience is required, just come ready to experiment and have fun! Space is limited, so register now! *Register with a friend, and you both get $25 off! 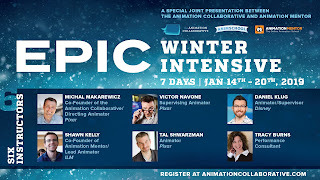 The Animation Collaborative will be putting on a week-long seminar this January. Sound epically intense? It will be! 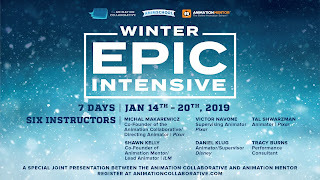 Come learn the craft from myself and other professional actors and animators at this unique event. First Bloom from Wintersweet Animation Studio on Vimeo. Here's a lovely personal short about first love by Tingting Liu, former Pixar intern and animator at Laika. Check it out before it disappears! Hi Y'all, here (finally) is my TEDx talk from this spring in my home town of Chula Vista!